A photograph of a mirror in a white space, as observed in the photographic work 'Steve Martin, 1972, 2004, Chromogenic print, 60 x 48 in. (152.4 x 121.9 cm)' by Tim Lee. This particular photograph is framed in a white frame and leaned against the gallery wall. 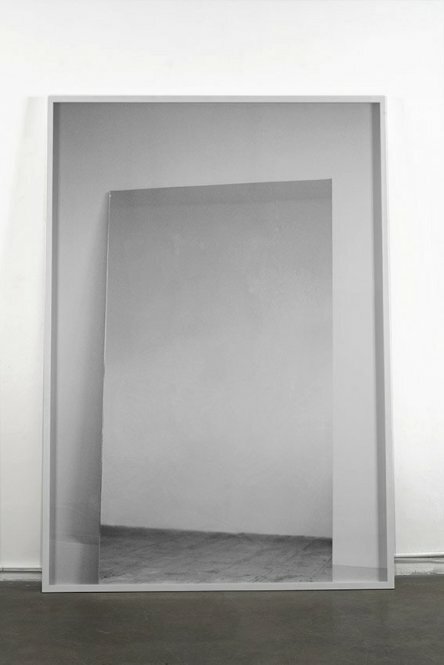 A black and white photograph of a mirror in a white space, propped up against a wall - as observed in the photographic work 'Steve Martin, 1972, 2004, Chromogenic print, 60 x 48 in. (152.4 x 121.9 cm)' by Tim Lee. This particular photograph is framed in a white frame and lent against the gallery wall.